Hello everyone! Today, I have a couple of jewelry pieces to share with you--a necklace and a pair of earrings. 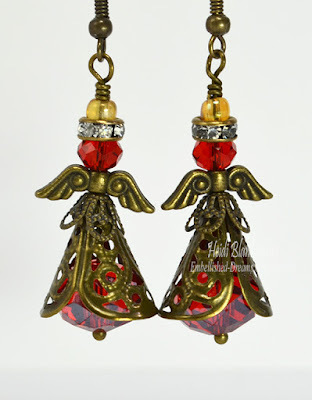 If you are looking for any jewelry projects for Christmas gifts the earring I am sharing today are very quick and easy to make. 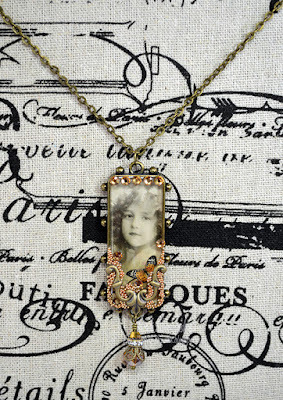 Here is the necklace that I designed. I love this sweet image of the girl with the butterfly. I used a digital image from ArtCult on Etsy. I absolutely love the images from this shop! 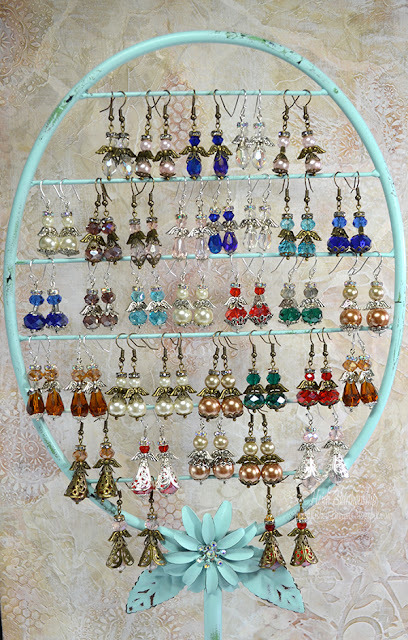 There are so many to choose from and they come in a variety of sizes. The best part--there is an instant download and what you see is what you get. I am not affiliated with her shop but I do highly recommend it. 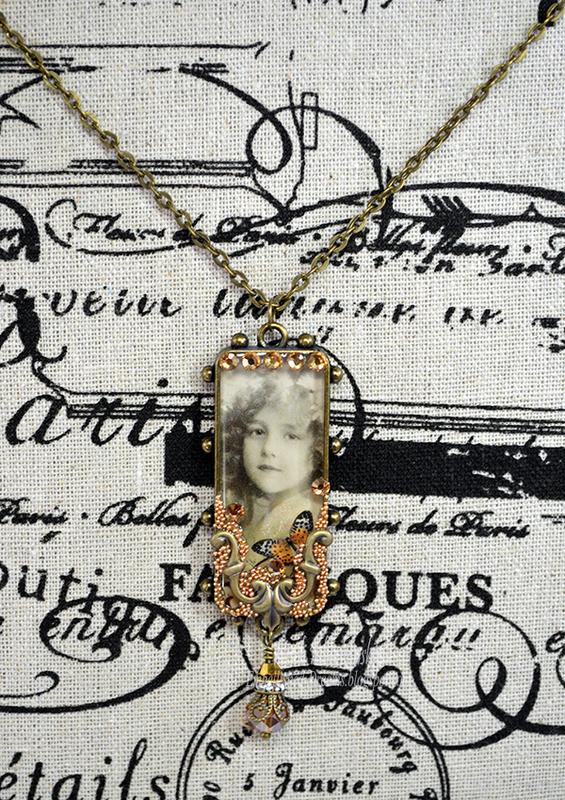 :) I added the image to a Hobnail Long Rectangle Bezel and then filled it with ICE Resin. 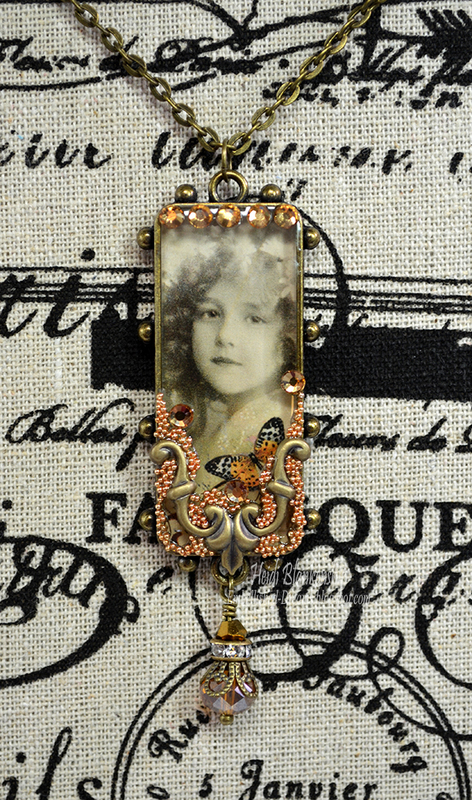 Then I used different little bits and pieces form ButterBeeScraps to embellish the bezel and create the beaded dangle. I used one of the Bronze Metal Filigree Embellishments (#550-B) on the bezel and then I added some copper micro beads and Light Colorado Topaz Flat Backs SS12. I thought the copper and topaz would bring out the colors in the butterfly. 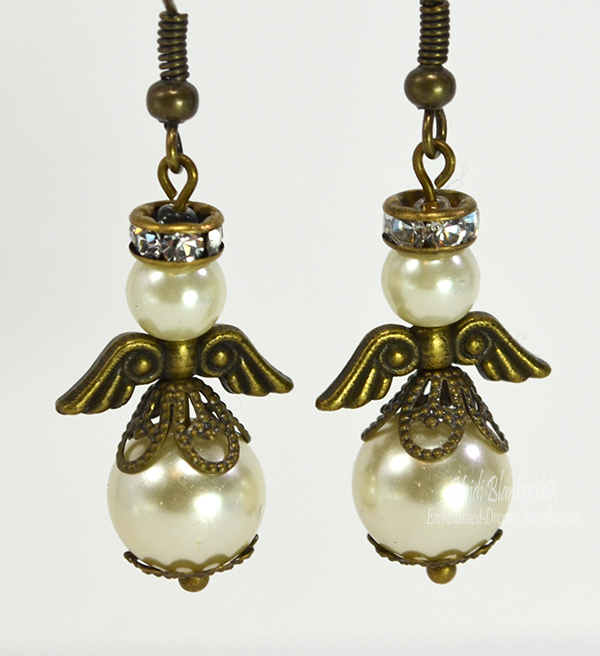 To create the beaded dangle I used a Bronze Ball End Headpin, Bronze Filigree Bead Caps (#CAP052-B), Clear Rhinestone and Bronze Rondelle Spacer Beads – 6mm (#BD006-B/CL), and a couple of beads from my own stash. Here is another photo of the necklace. These are the earrings I designed. Like I said if you are looking for some quick and easy Christmas presents these earrings would be perfect. 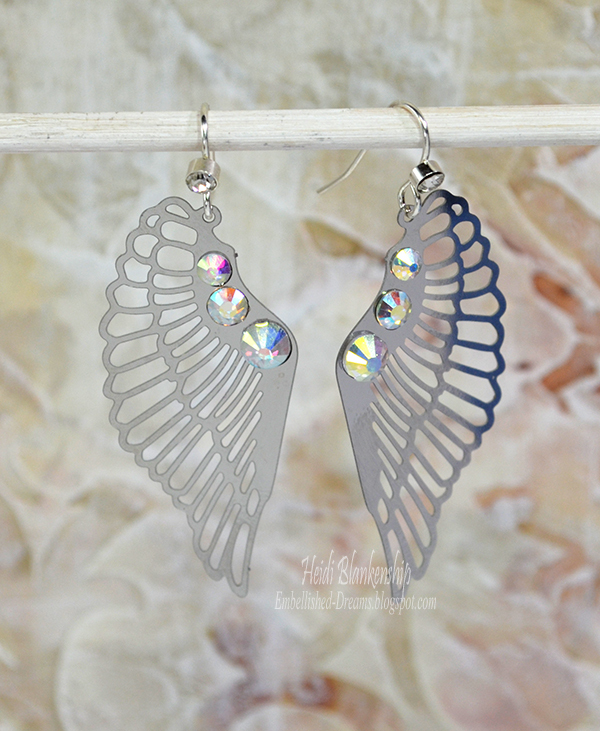 I used the pretty Silver Shepard Hook Earring Wires w/ Rhinestones (#J594-S). For the wings I used the Stainless Steel Wings Metal Filigree Embellishments (#686-ST) and added Clear AB Flat Backs SS20, SS16, SS12. Easy peasy--done in 5 minutes or less! Please be sure to visit ButterBeeScraps! Monique, adds new filigrees, jewelry findings and embellishments to the store every month. Hello blogging friends! Today, is my day to post for The Stamp Simply Ribbon Store. I have another CAS (Clean And Simple) card to share with you using some of the gorgeous papers from the Graphic 45 - Mon Amour 8 x 8 Paper Pad and 6 x 6 Paper Pad. These two paper pads are so beautiful and could be used for a variety of occasions such as --everyday and think of you, love, anniversary and weddings and after the first of the year Valentine's Day. The paper pad is filled with beautiful images and patterns and also several cut out pieces that are great for CAS cards. 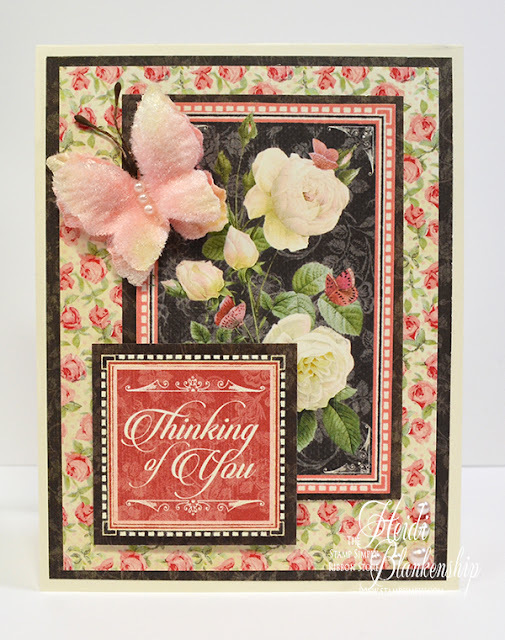 The base fo my card is a A2 top folding and I used some of the dark gray floral print to add a mat. 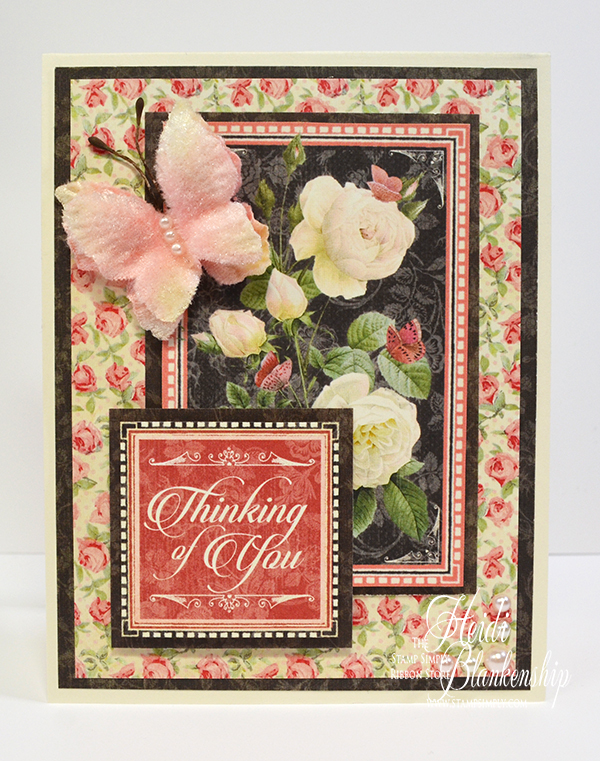 Then I layered a piece of the pretty rose floral paper on top. The main image is one of the cut out and so is the sentiment. I layered both pieces with the same dark gray floral paper. I added a few Therm-O-Web Foam Squares to add some dimension. 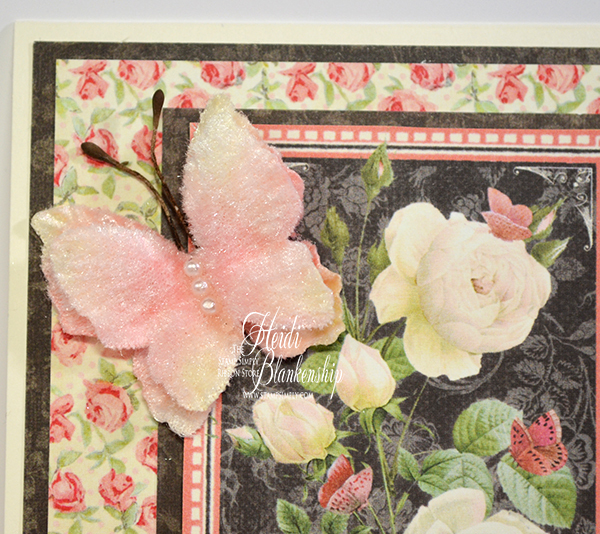 To finish off the card I added a couple of embellishments -- Petaloo Botanica Mums & Butterflies Pink and Melissa Frances White Pearls. Here is a close up of the main image, sentiment and butterfly. I love this butterfly and how perfectly it matches the paper. Can you see the pink little butterflies on the paper? Hello blogging friends! Today, is my day to post for The Stamp Simply Ribbon Store. I have another CAS (Clean And Simple) Christmas card to share with you. I know things get so busy with the holidays so it's nice to be able to quickly whip up some Christmas cards. 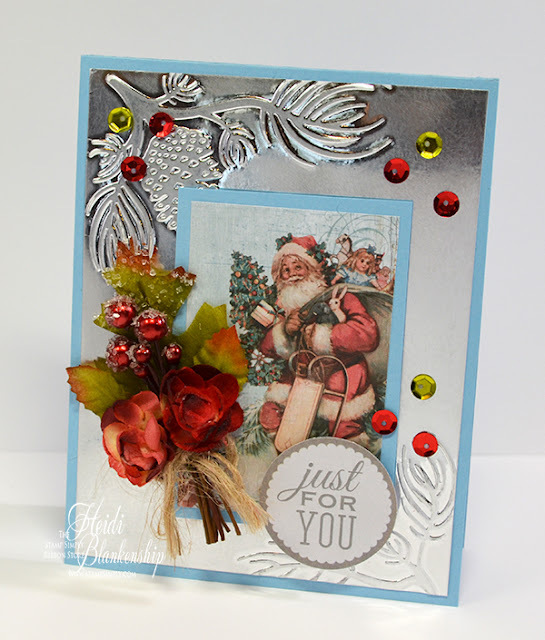 For the focal image on my card today I used one of the cut outs from the Kaisercraft Silver Bells 6-1/2'' Paper Pad. This is such a beautiful paper pad! 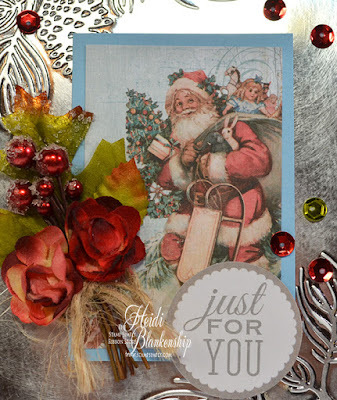 The vintage Christmas images are fantastic and there are a lot of die cut images included in the paper pad--perfect for CAS card! I used light blue cardstock for the card base which is a top folding A2 size. I also used a piece of the light blue cardstock for a mat behind the Santa image. For the background I used a piece of Bazzill Silver Mirror Cardstock and embossed it with the Darice Pine Branches In Corner embossing folder. Here is a before and after look at the Bazzill Silver Mirror Cardstock. I love how bright and shiny this paper is but for this card I wanted to tone it down a bit and give it a brushed/ aged look. The first piece is the before and the second piece is the after. I lightly sanded the paper with a very fine grit sanding block going in a circular motion. Doing this not only toned down the silver but it also helped to make the embossed areas really pop. Just a little tip--I used the tip of the corner on the sanding block to get in between all of the embossed areas and I also sanded over the embossing. In this close up picture you can really see how much the embossed area pops. 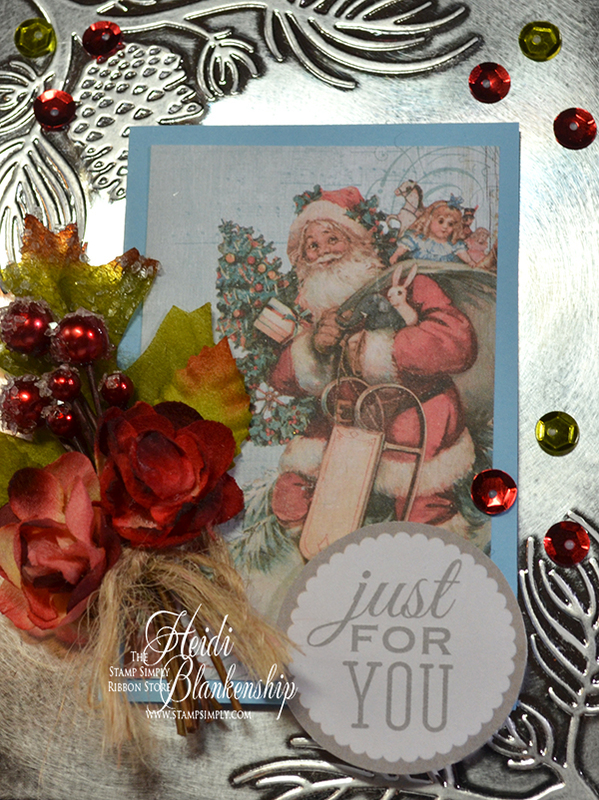 I used Therm-O-Web Foam Squares to add some dimension to the Santa image and also the die cut circle with the sentiment. For the flower cluster I used a Petaloo - Sugared Red Berry Clusters and then added a couple of flowers from the Botanica Minis Red. 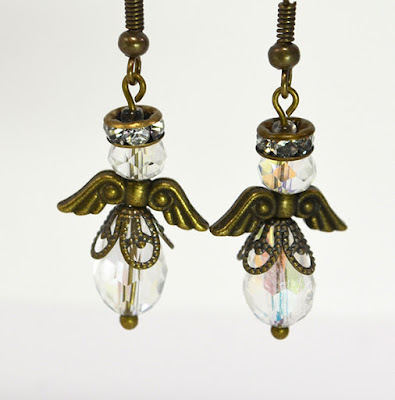 For a little sparkle I added a few sequins from the Prima - Say It With Crystals A Victorian Christmas collection. Angel Earrings - ButterBeeScraps - Small Business Saturday Shopaholic SALE-bration! Last year was the the first year for the show and they had 30+ vendor. It's a great opportunity to get out and do a some Christmas shopping and support local small businesses. Last year I made a few pairs of angel earrings and they sold out right away. So I decided to make more these year and do a few different style designs. 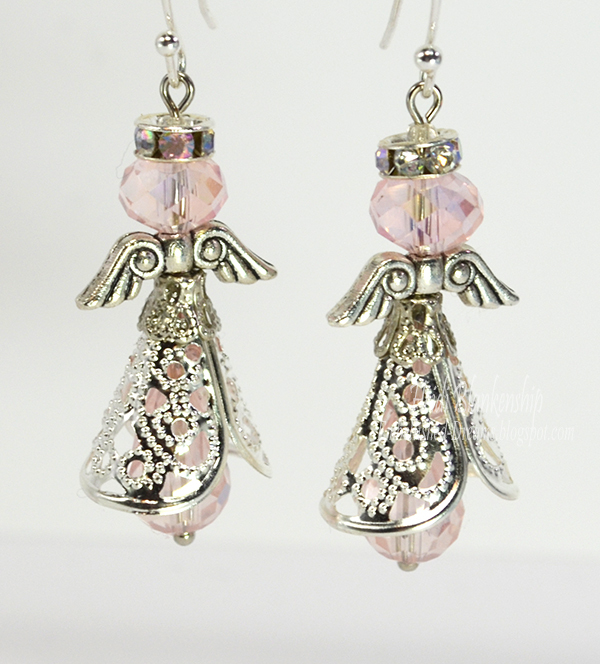 These are some of the angel earrings that I have made. I have them in bronze and silver. I used a lot of bead caps, beads, head pins and rondelles from ButterBeeScraps. All items from ButterBeeScraps are listed and linked below in the supply list. I also used several beads and bead caps from my own stash. I didn't take pictures of every pair but I did take some close ups of a few different designs. 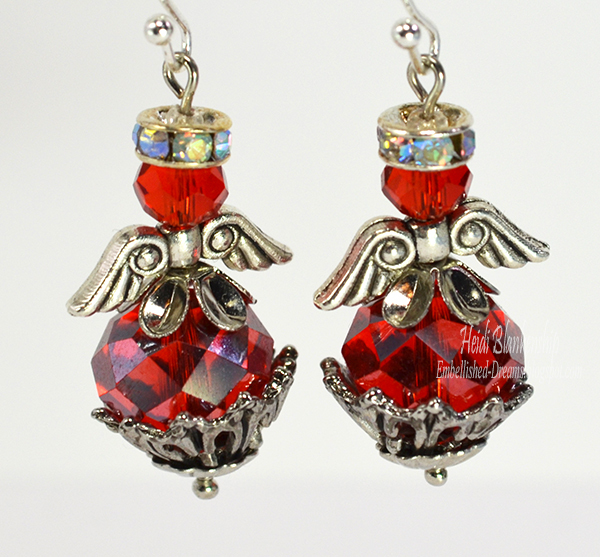 I hope you like all of the angel earring and you are inspired to make some. 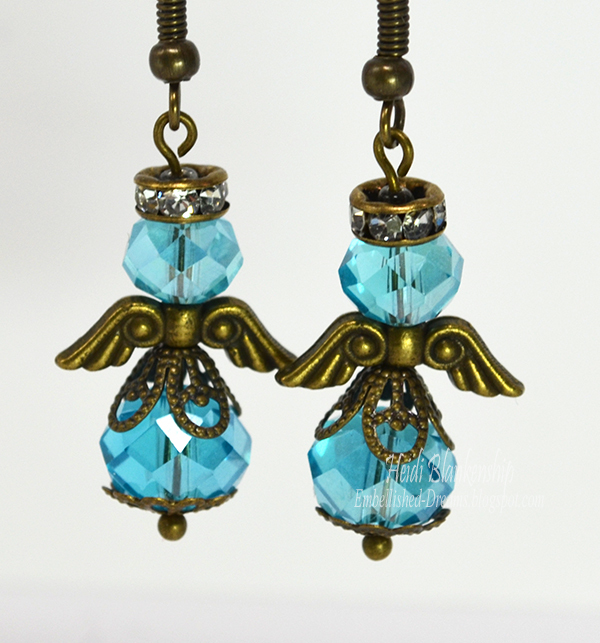 These would make really cute pendants for a necklace too. Hello blogging friends! Today, is my day to post for The Stamp Simply Ribbon Store. I have another CAS (Clean And Simple) Christmas card to share with you. Over on the Stamp Simply Blog we are celebrating the 12 Days of Christmas with CAS cards. If you are looking for inspiration to create some CAS cards then be sure to hop on over to the Stamp Simply Blog and check it out! There are so many beautiful cards from the design team. For my card I used some of the Wild Rose Studio - Painted Poinsettia paper. This paper is so pretty and has some beautiful images on it. I love this image of the little bird with the holly, berries and flowers. Originally this card was going to be an A2 size. 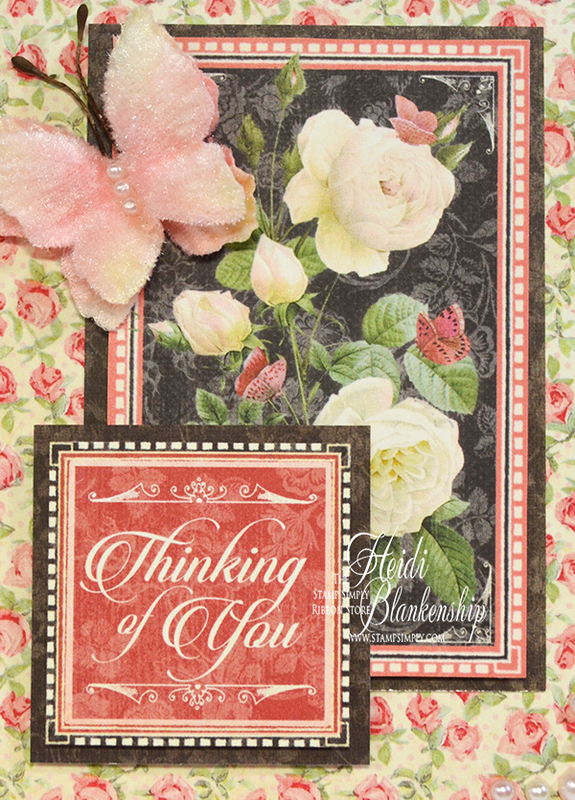 But it was my first time working with the Elizabeth Craft Designs 953 Tags & More 3 - Leaves die (which by the way I love!) and the tag was a little larger than I thought it would be. I had already cut the pattern paper to fit and A2 size card. So this is what I did to resolve this and have a 5.5 x 5.5 card--I cut a 5.25 x 5.25 piece of white cardstock so I would have a base to add the papers to. Then I cut another small strip of the pattern paper and added a strip of the Bazzill - Gold Mirror Cardstock along the side to fill in the space and then I had card front to fit the 5.5 x 5.5 card base. The Elizabeth Craft Designs 953 Tags & More 3 - Leaves die is a pretty neat die set and allows you to be able to customize your tag. You can make the tag different sizes and embellish it in different ways using all of the different die included in the set. To create my tag I used the leaf die for the top part of the tag. I saved the leaf drop out pieces to use as well. Then I die cut some small flowers. I added a little Tim Holtz Distress Ink - Mowed Lawn to the center of the flowers to try and make them look like the flowers in the pattern paper. I also added a Melissa Frances White Pearls to the center of each flower. I used JustRite Papercraft CR-02176 Christmas Handwriten Sentiments along with Memento - Rich Cocoa to stamp the sentiment and add the little berry sprigs. I used just a little Tim Holtz Distress Ink - Mowed Lawn to add a little color and then a Copic Marker - R85 Rose Red for the berries. 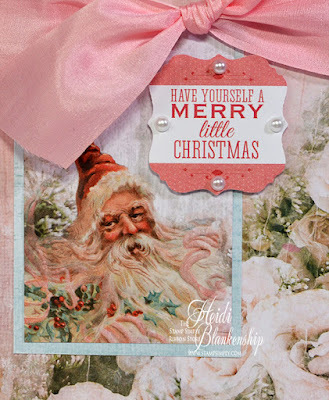 To finish off the tag I added May Arts Rose Silk Ribbon with a bow and then I also used some Therm-O-Web 3D Squares on the tag for some dimension. Hello everyone! Now that Halloween has passed and Thanksgiving will be here in just a couple of weeks I am in full swing for making Christmas cards, ornaments and presents. I have a sale coming up November 28th (more information to come) so I have been busy designing a lot of jewelry too. I am so excited to be a Guest Blogger for Tonic Studios today! I have a couple of Christmas cards to share with you. One of the cards is pretty CAS (Clean And Simple) and the other card has a lot of sparkle and detail. Lets start with the CAS card first. To create this card I started with a piece of white cardstock cut to 3-1/2 x 5. Then lay the die template across the top (5 in side), tape in place and die cut. 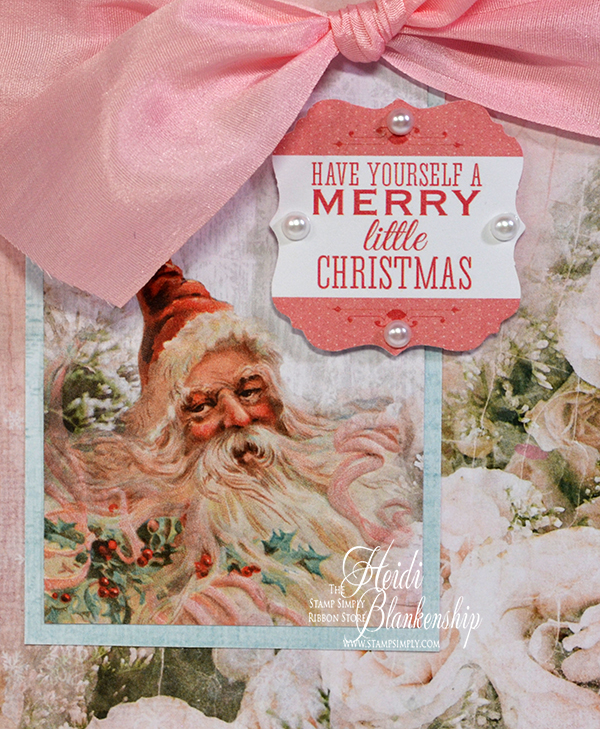 I used 598E Header Fold Die Set Christmas Wishes from Tonic Studios. After die cutting trim down sides to fit card and adhere to a light blue mat. 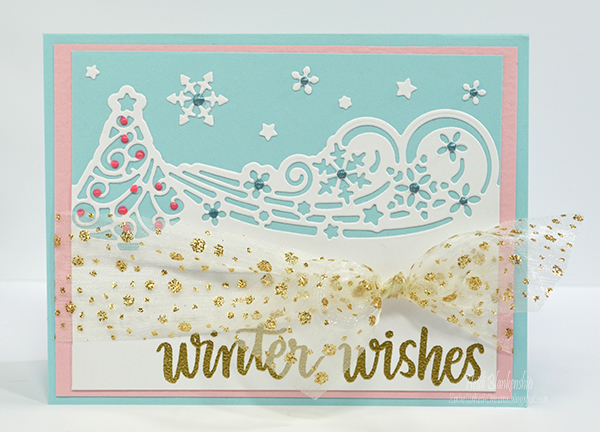 I stamped the Winter Wishes sentiment from Simon Says Stamps Hand Lettered Winter Wishes stamp set with VersaMark ink and heat embossed with Ranger Super Fine Detailed Gold Embossing Powder and a Heat Tool. Next I added a layering mat with pink cardstock. I used 422E Funky Tape Runner and 419E Craft Tacky Glue 120ml to adhere all the layers. 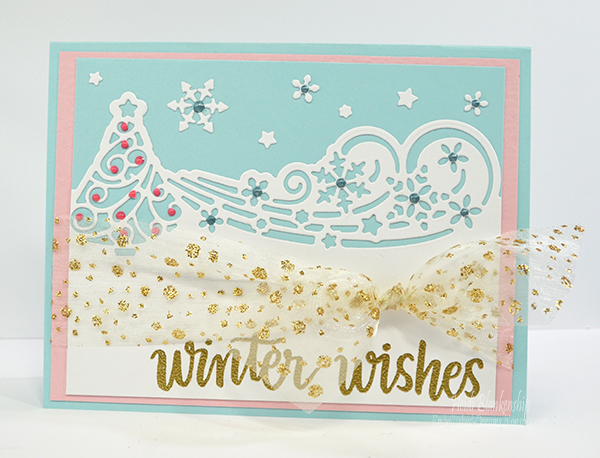 Save the drop out pieces to add stars and snowflakes to the top (sky part) of the card. I used 419E Craft Tacky Glue 120ml to adhere all the tiny pieces. Then I added Nuvo Crystal Drops - 660N Wedgewood Blue to the stars and snowflakes and 666N Gloss Carnation Pink on the tree to look like little lights or ornaments. To finish off the card I added some May Arts Sheer Gold Sparkle ribbon and adhered everything to a light blue A2 card. My second card is a lot more detailed, full of sparkle and I am using black for a non-traditional color. I have to tell you I absolutely love the frame die cut on this card! 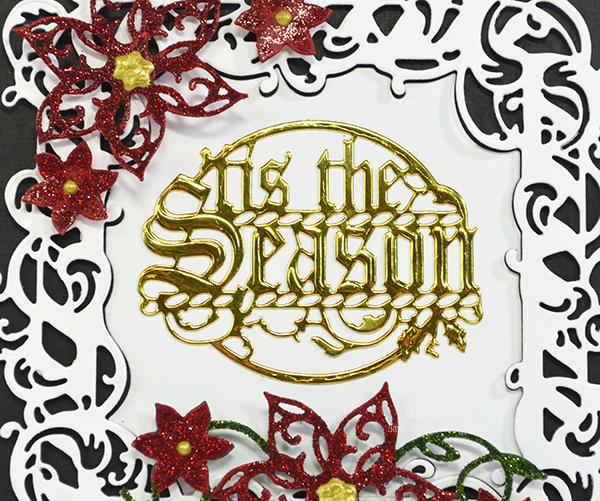 I used 641E Christmas Wreath Die Set 'Tis The Season from Tonic Studios. Now I know this die set is in the Christmas collection but you could really use the frame die template year round. I love all the flourishes. 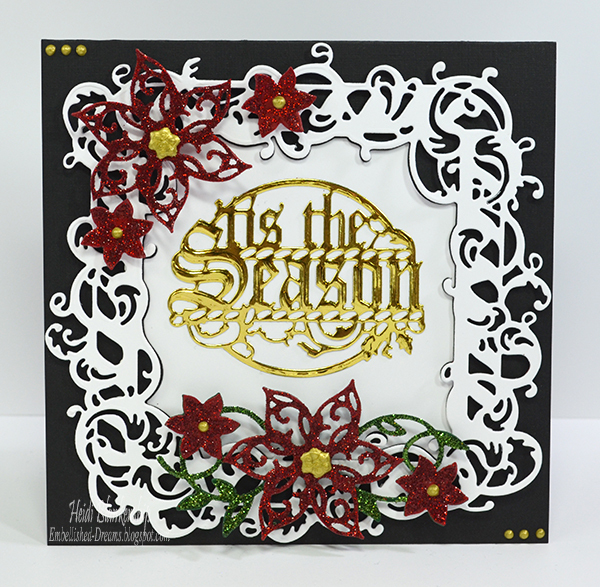 To start I die cut the white frame using the 641E Christmas Wreath Die Set 'Tis The Season. I added 3D Foam squares to the back of the frame to pop it up and add a little dimension. I added the frame die cut to a black 5.5 x 5.5 card. Then I applied 422E Funky Tape Runner to the white drop out piece and added it to the center of the frame. Next I die cut the Tis The Season sentiment using Gold Mirror cardstock. 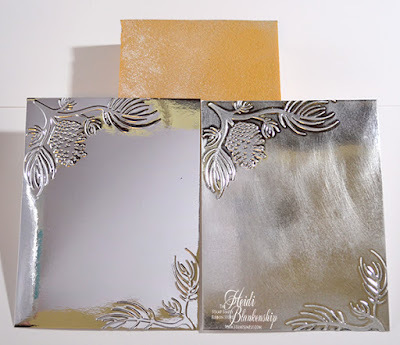 Here is a **TIP** Gold foil or gold mirror paper will show any little imperfections like the cut lines in the mats used for die cutting. To avoid this lay down a scrap piece of paper on your mat and then add gold foil or mirror paper and die on top--results--no imperfections. I used 419E Craft Tacky Glue 120ml to adhere the sentiment. I really like the detailed tip on the glue bottle--it has such a tiny hole and it is fantastic for gluing the detailed die cuts. 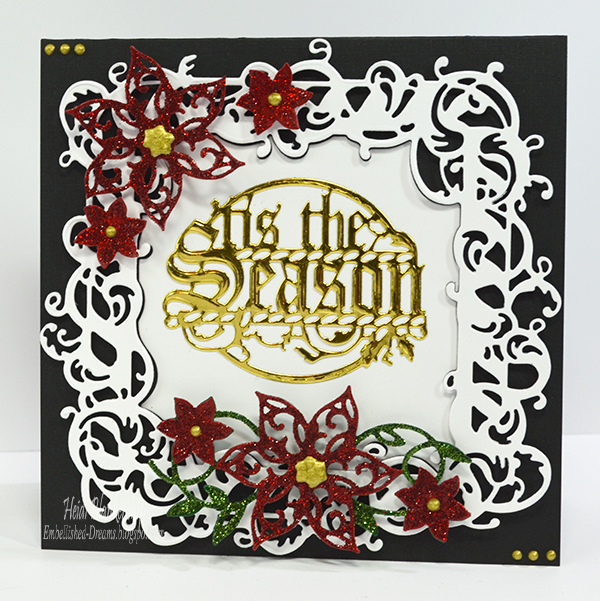 To create the poinsettias I used 80E Rococo Poinsettia Strip Die from Tonic Studios. I die cut the poinsettias three times--once with green cardstock and twice with red cardstock. On both red die cuts fussy cut out the flowers. 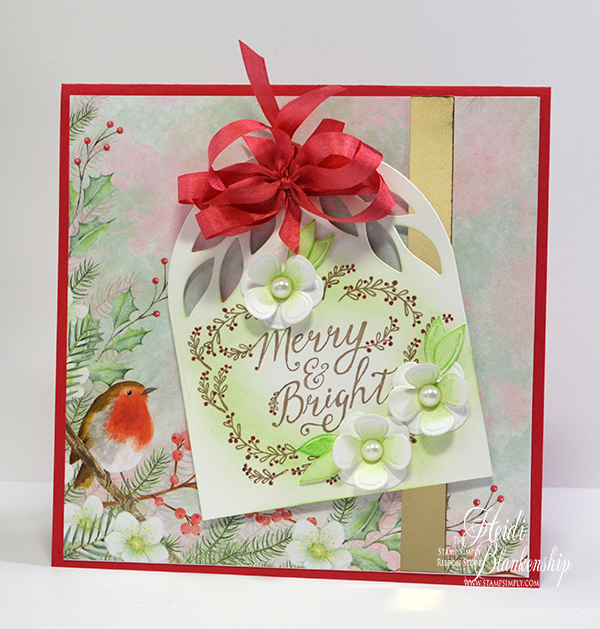 On the green die cut use the Nuvo 203 Glue Pen Medium to quickly go over the leaf and vine areas and then I added Nuvo Pure Sheen Glitter 701N Green. Then I used the Nuvo 203 Glue Pen Medium on the red poinsettias and then add Nuvo Pure Sheen Glitter 700N Ruby Red. 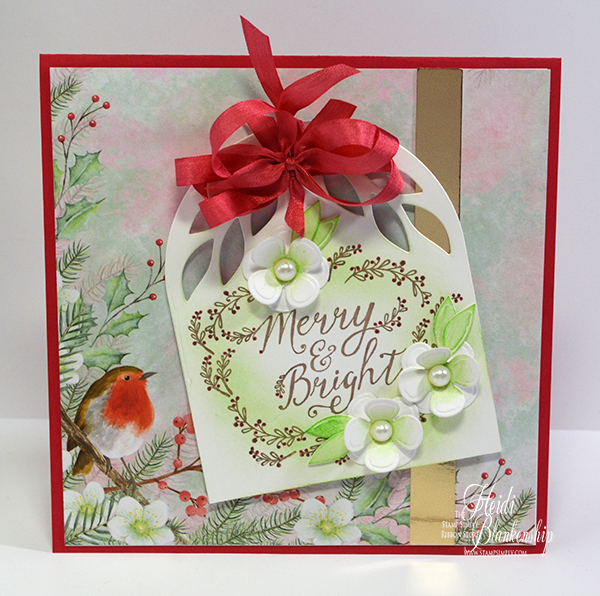 Tap off excess glitter and use 419E Craft Tacky Glue 120ml to adhere the red poinsettia pieces on top of the green poinsettia die cut piece. 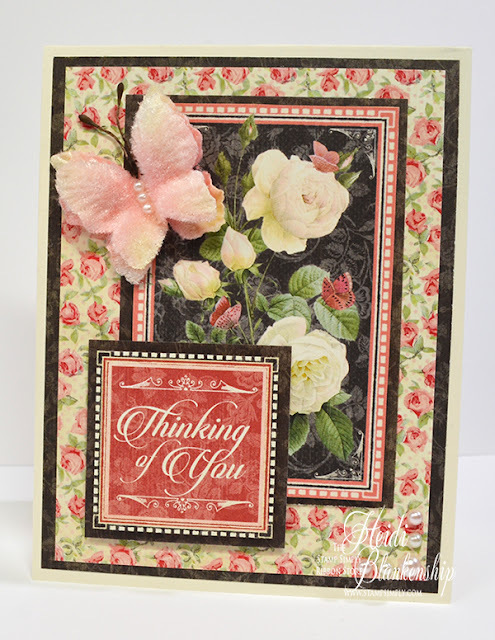 Use 3D foam squares on the flowers to add some dimension to the card. To finish off the poinsettias I added Nuvo Crystal Drops 653N Bright Gold to the flower centers. 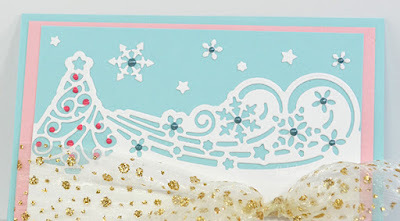 I also added some Nuvo Crystal Drops 653N Bright Gold to a couple of the corners on the card. I hope you enjoyed both of the cards I shared today. 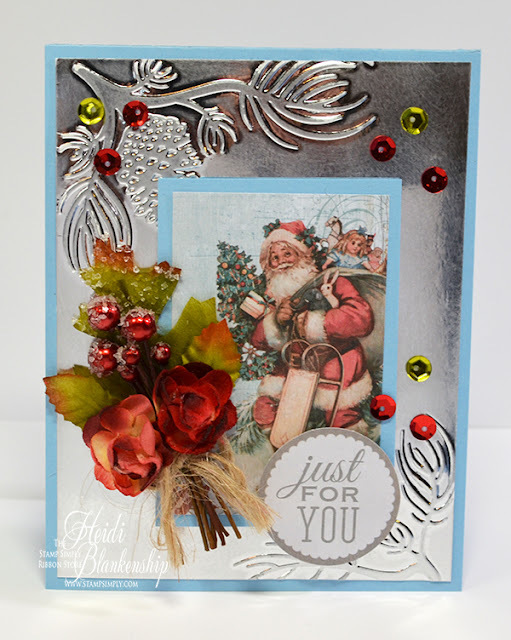 I am loving the Christmas die collection from Tonic Studios! Did you know that Tonic Studios US now has a blog and website? If you haven't already been over there you can click HERE to check it out. While you are there take a look around. They have a beautiful collection of dies, a variety of tool and some fabulous new Nuvo Pure Sheen Glitter and Nuvo Crystal Drops. TONIC US AMBASSADOR DESIGNER CALL! You can click HERE for all of the information. 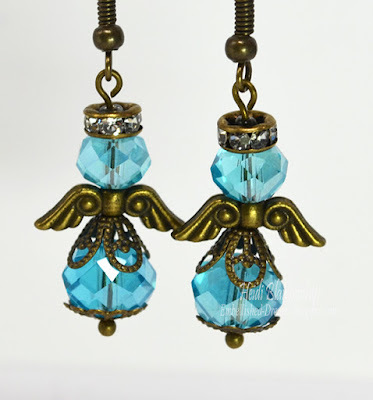 Would you love to win some fabulous crafty goodies from Tonic Studios USA? During this season of gratitude and Thanksgiving Tonic Studios will be having some amazing giveaways. You can click HERE to visit the Tonic Studios USA Facebook Page and find out the details on how you could win! Thanks so much for stopping by today and I hope you have a beautiful day! Hello blogging friends! Today, is my day to post for The Stamp Simply Ribbon Store. I have another CAS (Clean And Simple) Christmas card to share with you. 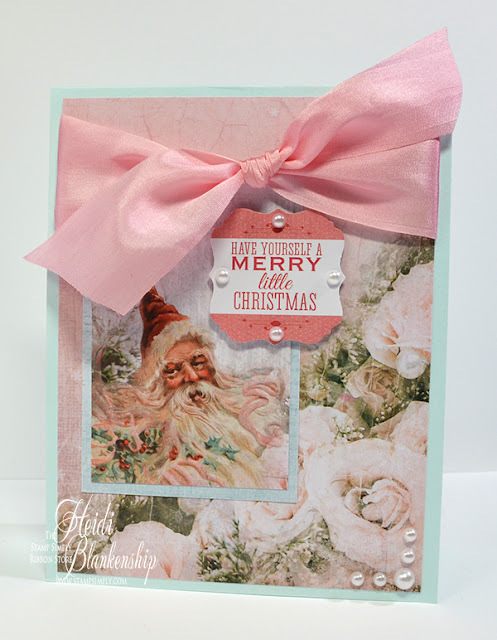 Over on the Stamp Simply Blog we are celebrating the 12 Days of Christmas with CAS cards. Today, is day 5 and if you are looking for inspiration to create some CAS cards then be sure to hop on over to the Stamp Simply Blog and check it out! Here is the card that I designed. 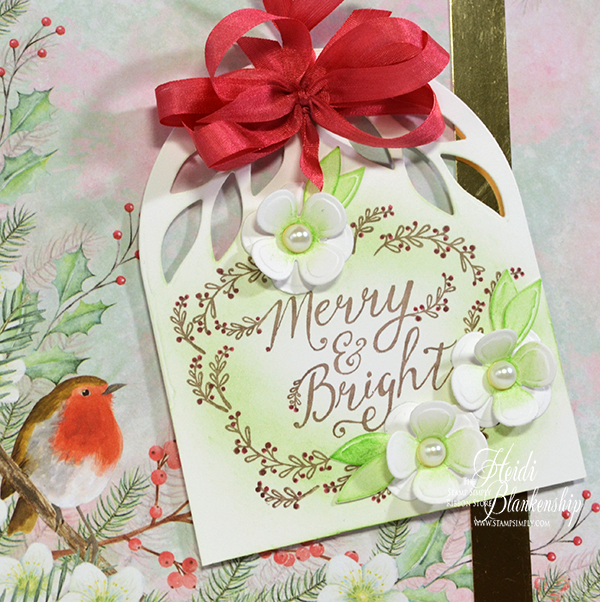 I used the KaiserCraft Silver Bells 6-1/2'' Paper Pad to create this card. 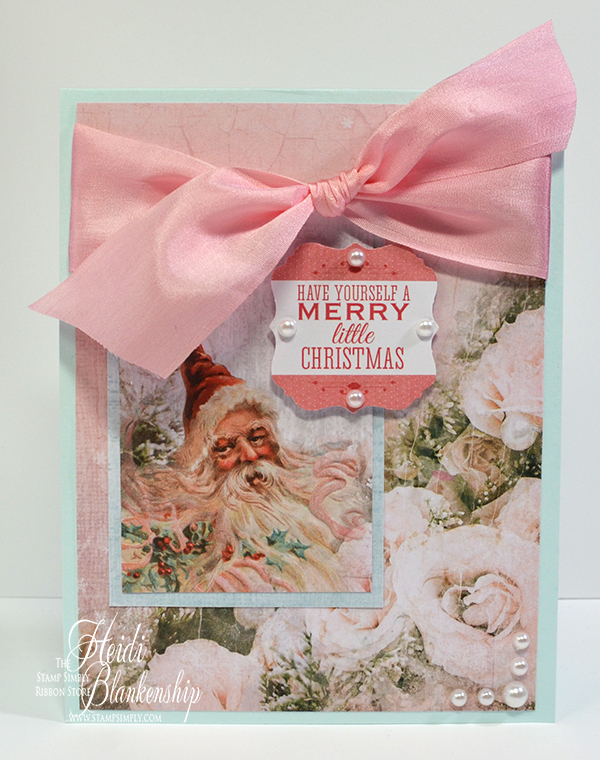 This paper pad is filled with beautiful pastel Christmas images. It also includes some foiled papers and die cuts in the paper pad. I just love these colors for Christmas. Here is a close up of the beautiful vintage image of Santa. I used some light blue pattern paper from the paper pad to add a mat layer behind the image. The label shape with the sentiment is also from the paper pad. I added a couple of Therm-O-Web 3D Square to pop the die cut shape up. Then I added some May Arts - Pink Silk Ribbon and Melissa Frances White Pearls. The card base is light blue cardstock and this is an A2 top folding card. Hello everyone! Today, is my day to blog on the Casa de Jewels Blog and I have a five strand aqua and silver beaded bracelet to share with you. Here is a look at the bracelet. I just love how it turned out and the aqua beads are so pretty! 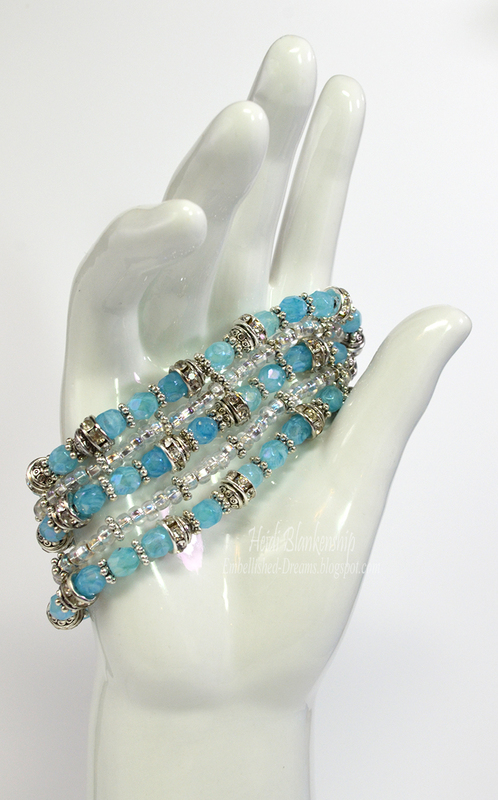 click HERE to visit the Casa de Jewels Blog.